A modern desk table designed with sturdy laminated chipboard. 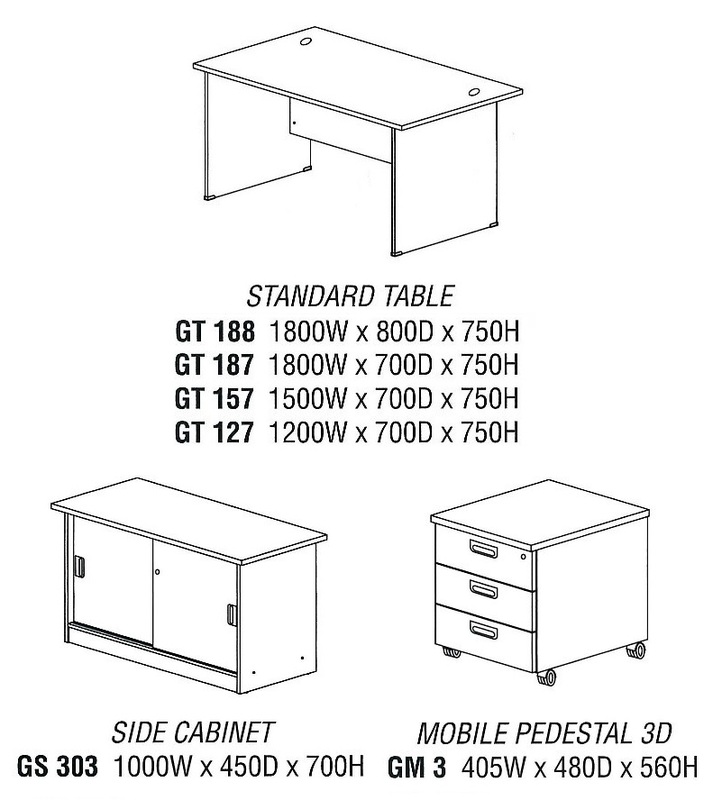 Comes with a side cabinet and mobile pedestal drawers. Ideal as a workstation for home or office usage. Perfect for computer usage and studying. Top : Melamine Laminated Chipboard in 25mm Thickness With 2mm ABS Edging. Top Edging Color : Matching To Surface Color. Panel Leg : Melamine Laminated Chipboard in 16mm Thickness With PVC Edging. With Small Grommet For Telephone Cabling to access. Assembly With Allen Keys And Minifix. Size : 1000W x 450D x 700H (mm). Body : Melamine Laminated Chipboard in 16mm Thickness. Door : Melamine Laminated Chipboard in 16mm Thickness With Plastic Recess Handles. Top & Door Edging Color : Matching To Surface Color. ​With 1pc of Adjustable Shelf in 16mm Thickness with PVC Edging. Come With Lockset (2pcs of Keys). Size : 405W x 480D x 560H (mm). Drawer Panels : Melamine Laminated Chipboard in 16mm Thickness With Plastic Recess Handles. Top & Drawer Panels Edging Color : Matching To Surface Color. Come With Central Lockset (2pcs of Key) & Castors. Drawers Pull To Open On Steel Drawer Slide.